I had my previous down comforter for almost 30 years. This new comforter is amazing!! 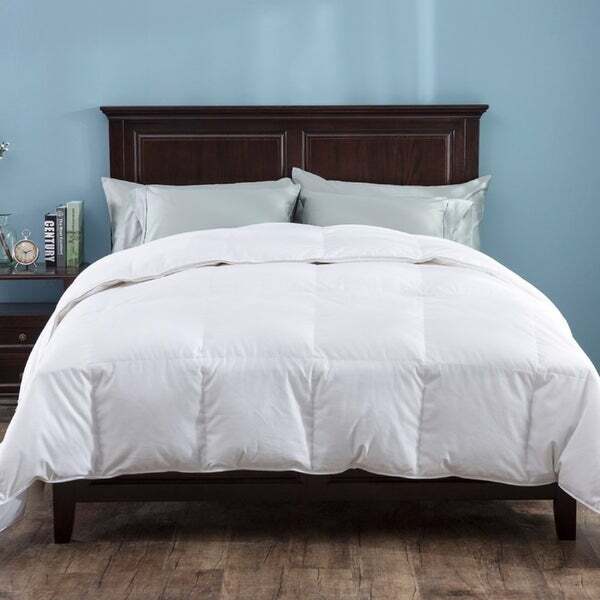 The cover fabric is so soft, the weight of the comforter is very substantial but also doesn't feel too heavy, and it keeps me and my husband the perfect temperature at night. It looks like it costs a lot more than what I paid for it. I love and I'm so glad I purchased it. I highly recommend this beautiful comforter! Experience the ultimate in luxury with the soft 700 thread count cotton sateen fabric. Filled with 600 fill power white goose down and a 1 inch gusset, you'll feel as if your covered by a cloud. The comforter is designed with 14 inch baffle box construction to avoid shifting, as well as corner loops to help secure a duvet cover. Comforter is made from 700 thread count 100% cotton sateen fabric. Filled with 75% white goose down and 25% white goose feathers. Spot Clean, Dry Clean Recommended Materials are Responsible Down Standard certified and cleansed by Oxipower technology. Dimensions 88.0 In. X 68.0 In. X 4.0 In. This is by far the greatest down comforter ever. It’s not super bulky but it feels heavy and is so warm. I love that you can tie the corners of the duvet and comforter together. This is a great product. My 17 year old cat would get up on my bed however he couldn't get back down. Needless to say, my down comforter became his new litter box. It was ruined so I began stalking Overstock for one and that fit my needs. I kept my fingers crossed there would be a killer Memorial sale and coupon. I scored on this one! Thank you Overstock! I needed to update my review. I admit that I didn't follow the fluff once a month directions. I figured my quick everyday fluff would have been enough. NOPE! The baffle boxes are not sealed so the feathers can shift to other boxes. By Sept some of the boxes had no feathers and the ones that hung over the bed and clumps of them. I also admit my 60lb dog lays on it during the day. I'm not sure if this added to the shifting feathers. Bottom line, I would no longer recommend. Very nice. love it. everything I was looking for. Soft and fluffy i did add a duvet cover to it. The price was very reasonable. You do have to let it unfluff after it being in the packaging. This comforter did not disappoint. Beautiful down comforter & the feathers are evenly throughout, which makes it very warm & comfortable! My daughter loves this comforter! Love this. Its a nice weight and feels silky smooth. I never rec’d this item called emailed saying I didn’t receive this item never received a ferfund never recd another comfeeter which I was hoping for. Hoping for putting this review in will help.